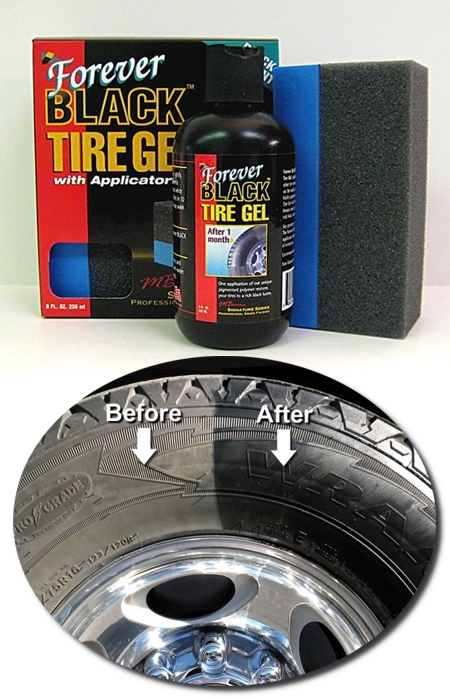 Forever BLACK™ Tire Gel, unlike other tire dressings on the market, is a black pigmented polymer. Restore the faded bronze look of your tires to a rich black luster. Say goodbye to messy sprays! Our handheld applicator eliminates the mess of over sprays. One easy application will protect and restore your tires to their original brilliant appearance. Provides coverage on an average of 12-20 tires (20"). Kit contents: One (1) bottle of Forever BLACK™ Tire Gel, 8 ounce (236ml); and one (1) Applicator.